Since its first commercialization in the early 1990’s, the Li-ion batteries (LIB) technology has spurred the spread of portable electronics as well as enabled the realization of electrical vehicles with a reasonable driving range. Nevertheless, challenges still remain concerning the capacity of LIBs to enable the use of renewable energy to the grid while minimizing its footprint on Nature. Hence, sustainability and cost are becoming the overriding factors to consider. Efforts have thus been made in developing sustainable electrode materials as well as electrolytes. Toward that goal, aqueous electrolytes could provide a lower-cost, safer and non-toxic alternative to organic electrolytes, providing that the overall battery performances are optimized for long-term application. Started in 1994, the quest for aqueous batteries quickly showed limitations owing to the poor energy density of such system, which is limited by the narrow electrochemical stability window of water (1,23 V) when compared to organic electrolytes. Recently, the use of highly concentrated ‘water-in-salt’ aqueous electrolytes was proposed, which allows operating at potentials greater than 3V. While this finding has generated a lot of excitements, concerns remain regarding 1) the origin for such increase of the electrochemical window as well as 2) the long-term efficiency of such systems. 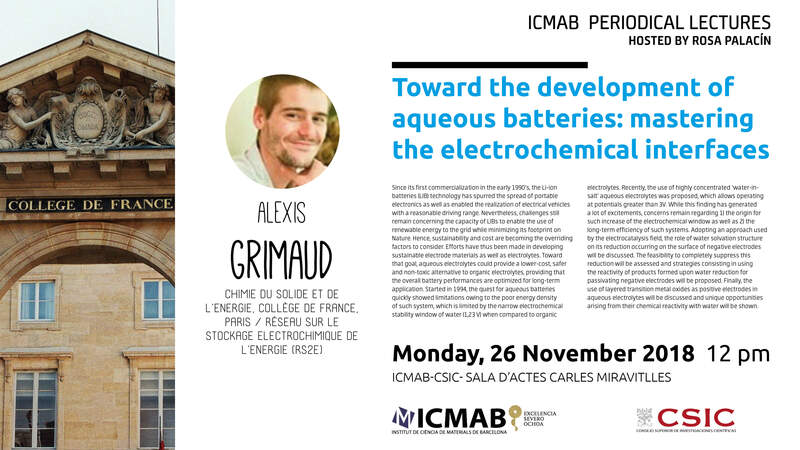 Adopting an approach used by the electrocatalysis field, the role of water solvation structure on its reduction occurring on the surface of negative electrodes will be discussed. The feasibility to completely suppress this reduction will be assessed and strategies consisting in using the reactivity of products formed upon water reduction for passivating negative electrodes will be proposed. Finally, the use of layered transition metal oxides as positive electrodes in aqueous electrolytes will be discussed and unique opportunities arising from their chemical reactivity with water will be shown.